•	About 96 percent of visitors originated in the United States, while 4 percent were international visitors. The majority came from Canada (25 percent) and the United Kingdom (20 percent), followed by Germany, Italy and Australia. •	Visitors produced an estimated direct spending of $310.5 million and indirect spending of $80.5 million, for a total economic impact of $391 million. That level of spending would support 4,973 jobs on Arizona’s tribal lands. •	Visitors concentrated general sightseeing (53 percent), shopping (37 percent), looking at/buying arts and crafts (25 percent), visiting historic sites (22 percent), and casino gaming (20 percent). Visiting cultural centers/museums (18 percent) and eating traditional foods (18 percent) also were important activities. Where: Scottsdale Civic Center Park, 3939 N. Drinkwater Blvd. 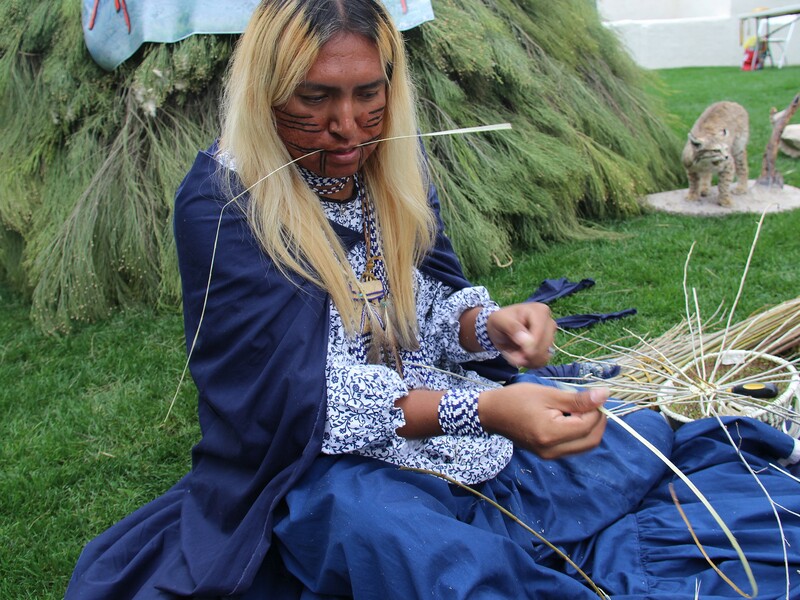 SCOTTSDALE – Timothy Ward Jr. weaves a traditional Apache burden basket. The Clark-Begaye family from the Navajo Nation prepares fry bread. Three young Hopi dancers put on their regalia before the opening performance. For only the fifth time in the past 15 years, a majority of the state’s 22 tribes have gathered to promote tourism for Native Arizona, one organizer said. Donovan Hanley, president of the Arizona American Indian Tourism Association, said it’s “pretty unique” to have all the tribes together. Organizers expect large crowds to attend the Arizona Indian Festival at Scottsdale Civic Park, which runs through Saturday. On Thursday, Minnesota resident Linda Hedlund stopped by a booth promoting Antelope Canyon on the Navajo Nation. “It’s a very interesting gathering of tribes, several I have never even heard of,” the 65-year-old said. 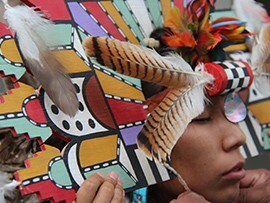 Organizers said they hope the exposure will entice people to come back to visit Native Arizona. Tourism is Arizona’s No. 1 export industry, bringing in $19.3 billion in 2012, according to the Arizona Office of Tourism. And the state’s rich Native American culture attracts a significant amount of that. One state tourism study estimated the yearly economic impact of visitors to Arizona’s tribal lands is roughly $391 million. For years, the state and tribal associations have promoted tourism on the national and international level. Although the 2005 study commissioned by state tourism office indicated the vast majority of visitors came from the United States, about 4 percent were international visitors. Part of Arizona’s attraction comes from the variety of experiences found here: Visitors can hunt trophy elk on the San Carlos Apache tribe. They can catch a baseball game on the Salt River Pima-Maricopa Indian Community. And they can photograph exclusive views of the Grand Canyon from the Hualapai tribe’s Skywalk. The attractions often depend on the tribe’s geography. The study indicated that tribal land visitors are slightly older, have higher annual incomes, stay longer and spend more daily than Arizona visitors generally. The main reasons people visit are sightseeing and shopping, but tribal officials hope visitors also learn more about the culture. A young Hopi woman puts on a water maiden headdress for the Arizona Indian Festival’s opening dance performance. 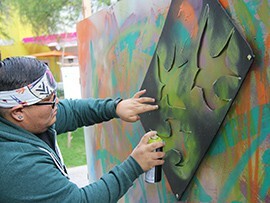 A Native American artist demonstrates the making of spray-painted street art at the Arizona Indian Festival at Scottsdale Civic Park. Timothy Ward. Jr, 30, weaves a traditional Apache burden basket at Arizona Indian Festival at Scottsdale Civic Park.